This issue features no less than three artists, which is both good and bad. Good in the sense that they are high-quality illustrators, bad in the sense that it’s the second issue and already there’s a change-up in the art team. I like Doc Shaner’s work, as it helps give Superman an old-school feel, reminiscent of Steve Rude’s work on the World’s Finest mini-series back in the late ‘80s. And then we have The Dude himself (no, not THAT one), whose style has continued to evolve since the World’s Finest mini-series back in the late ‘80s (yes, THAT Dude). It seems to incorporate elements of Wayne Boring and Jack Kirby, becoming something new in the process. Unfortunately, I fear Steve Rude will not be a regular, though I hope otherwise. 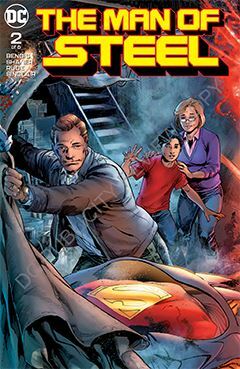 The centerpiece of this issue is when the Man of Steel takes down one of his long-time villains. Superman, giant mechanical beastie, feats of strength – what’s not to love? It (along with the red trunks) reinforces the message that Classic Superman is back. Whether the Daily Planet will stick around as well remains to be seen in a later issue. But given that Man of Steel is currently a weekly publication, how long can that be? Kudos to DC Comics for rolling out a weekly series, but I can only applaud that as long as the quality holds. I’d rather have it right than right now. If need be, I don’t mind going back to a monthly schedule.